This package includes the book’s revised edition and DVD with bonus interviews with columnist Naomi Klein, historian Greg Grandin, Maryknoll Sister Terry Alexander, and two poems by Martín Espada. Orders shipped upon purchasing. Home Use DVDs are intended for private, home viewing only. See purchase options below for university, library, community, or other educational uses. Intended for use by the acquiring educational institution only. 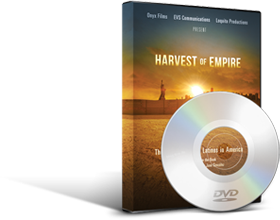 With the purchase of this DVD, Higher Education Institutions are licensed to show this DVD in classrooms and libraries. In addition, acquiring educational institutions may host non-profit, on-campus screenings to staff, faculty and registered students only. Intended for use by the acquiring school or public library only. Public screenings are not allowed. Low price for educational use in community organizations. Includes rights for community or public screenings without paid admission. Package includes our promotional support for your event. Make your screening event into an educational forum or fundraiser. 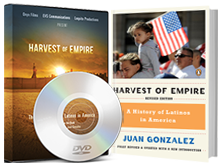 One kit includes: 1 Community Use DVD for screening, 10 Home Use DVDs to sell or raffle, 1 movie poster and an autographed book by Juan González. Also includes press kit and electronic image easily convertible into promotional flyer. Note: for events over 100 people, please contact us. Get the 4-pack DVD set, and share with inner circle. Orders shipped upon purchasing. Home Use DVDs are intended for private, home viewing only. See purchase options for university, library, community, or other educational uses. $69.95 – SAVE OVER 20%! Get the 10-pack DVD set and give as gift. Orders shipped upon purchasing. Home Use DVDs are intended for private, home viewing only. See purchase options for university, library, community, or other educational uses. This version includes bonus interviews with columnist Naomi Klein, historian Greg Grandin, Maryknoll Sister Terry Alexander, and two poems by Martín Espada. Price is subject to increase with new edition. Orders shipped upon purchasing. Home Use DVDs are intended for private, home viewing only. See purchase options for university, library, community, or other educational uses.